By: Jocie Műller, 9 years old. Today is the last full day of summer. I looked it up to be sure, so it's true. That means it's an equinox; day and night are equal. We - my dad (Jakob) and mama (Jaymie) and I - had a really busy summer. We went to Canada to visit my new great grandma (Mama's grandma - Mama and Dad just got married last May) and we went to Boca Raton in Florida to visit my new grandparents, and we went to Delaware - it's called The First State because it was the first state to rattify the consitution constitution. We went there because I have to see a doctor every summer. He's a specailist specialist in my kind of condition, which is called Achondroplasia Dwarfism (I checked the spelling; it's right). That means I'm a Little Person, or LP. It's generic genetic, they said. Anyway... its the end of summer, and Mama asked me to write an essay on my favorite book I read this summer. We both had a reading list, and I beat her finishing mine. I liked it because it had a girl in it who did things, and I like to do things. I'd like to have adventures like Drest (that's her name) has. Mama says I'm too young for those kind of adventures, like a quest to rescue people, but she made some other things this summer feel like adventures, like snooping around the hospital where I had to go for tests, and exploring the beach in Boca Raton. 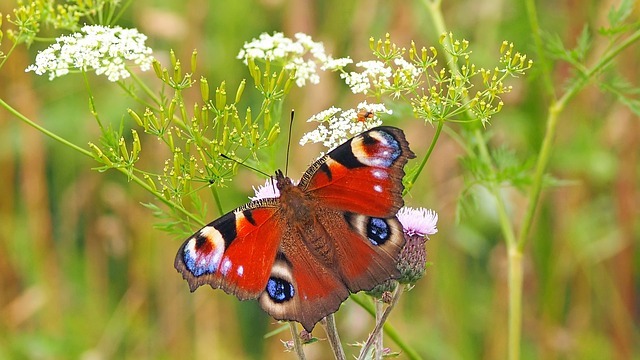 Boca Raton has a butterfly garden and a sea turtle sanctuary, too. We went with Gramma and Grampa to look at the butterflies. I like butterflies. My favorite was the Peacock Butterfly. It was so pretty! Gramma bought me a butterfly coloring book for my birthday, and I really love it. 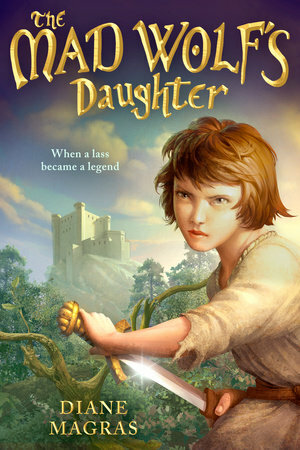 So.... that was my favorite book this summer, The Mad Wolf's Daughter. 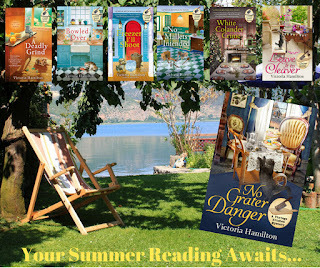 Mama says I should ask you all... what was your favorite book to read this summer? Any book at all, she says, any gener genre (I think that means kind of book, like mystery or romance or adventure) at all. Answer Jocie's question - What was your favorite book that you read this summer? 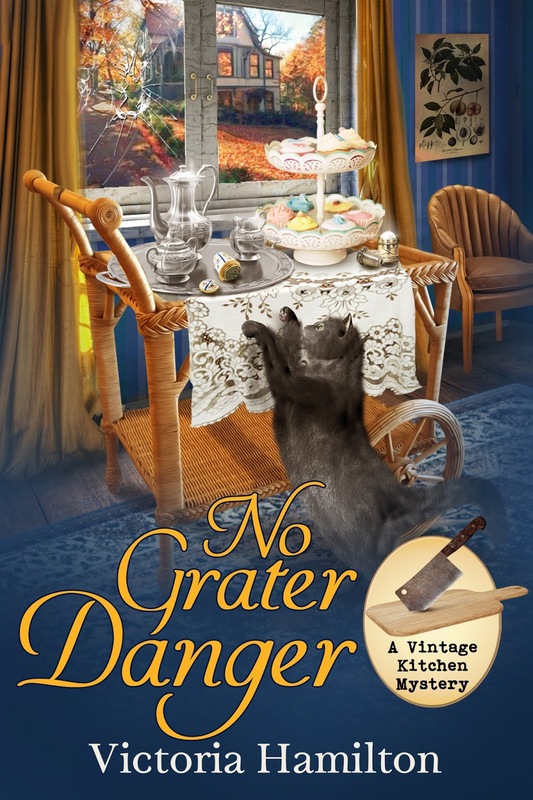 - leave your first name, email address (email (at) yourserver (dot) com) and be entered to win an ebook copy of either Leave It to Cleaver OR No Grater Danger!! Enter by Midnight, September 22nd. *Note.... comments left after midnight, September 21st will go into a moderation queue and be approved on the 22nd or 23rd. I read a bunch of historical romances that I really enjoyed. I have read the Paws and Claws series by Krista Davis. I read outloud at night to my little dog, Mojo. He was a rescue dog and would whine when he had to go to bed, even though he sleeps in my room. I started reading to him and found out it calmed him down and he would sleep! Survival of the Fritters by Ginger Bolton excellent read. I love a good cozy mystery. What a charming post today! Either The Artisan Heart by Dean Mayes, new author and a marvelous story, or Field of Bones by J. A. Jance, because I always love her books and it had me going back and re-reading some in the series. Thanks for the giveaway. 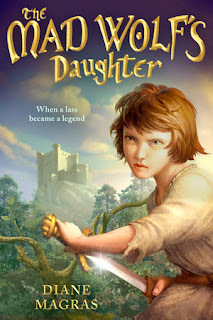 I just finished Garth Nix Goldenhand in his Old Kingdom series. Outstanding! One of my favorite reads this summer was Donna Andrews' Toucan Keep a Secret. One of my favorites was Nobody Said It'd Be Easy by Patty Blount. Another was Good Luck With That by Kristan Higgins. It was a difficult story to read but had a powerful message. I just finished Meet Your Baker by Ellie Alexander. Thanks for a chance to win your giveaway. I am just finishing up "Freezer I'll Shoot"! 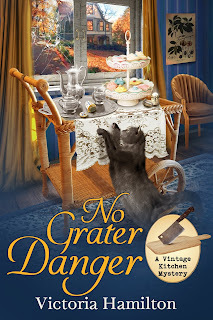 I started read the Amanda Cooper series and am so glad I did since that has brought me to the Vintage Kitchen series, which is loads of fun! I read a lot over the summer as I did a few readathons. I also read with my grandchildren. We read Ready Player One which I think I loved more than they did. It had a lot of references to things that were before they were born. It was cool though because it gave us a lot to talk about. We also enjoyed Mystery of Hollow Inn on Audible. Another book the grandkids loved was Benjamin Dragon-Awakening. As for me, I did The Great American Read with my Public library so I read a few books I wouldn’t have normally chosen. That was interesting and I found some good books. I think my favorite though was a book called Waiting for Eden. I cried buckets, got mad some and it made me wonder what I would have done in a similar situation. It is an adult themed book so yeah don’t check it out yet. I do recommend it to adults though it isn’t a cozy. It is hard for me to pick a cozy. I love so many! Tonya Kappes came out with a camping series that is super fun, (really though all her books are a hoot), V M Burns has a dog cozy that I just loved, In the Dog House. I love dogs. I also read a camping one Real Actors, Not People, that not only gave me a new author but I fell in love with the series. It’s been a wonderful reading summer! I really enjoyed hearing about all of you and your summer reading. Thank you everyone for entering... I have chosen my winner and emailed her!